Click here to find a map of Boddington and Ranford. You will also find here a map showing points of interest for tourists walking around Boddington town site. Boddington Community Resource Centre is our local Visitor Information Point and as such has a wealth of information on the local region. The Resource Centre is located at the Old School. The staff at the Old School are all local and will be able to recommend what you can do and see in Marradong Country. The BCRC is open 7 days a week – Monday – Friday 7.00am to 6.00pm, Weekends and Public Holidays 9.00am – 1.00pm. The Hotham River runs through Boddington and we have a lovely walk trail right alongside the river. In summer you are able to walk along the Lions Weir to the other side of the river and enjoy the wildlife on and around the river’s edge. The river also offers the opportunity to fish for local fish species, take a canoe ride or wet your toes along its edges. A large open park space with gazebo and BBQs is available all year round to enjoy a tranquil BBQ with friends and family. The local Friends of the Reserves have created a lovely walk trail that starts from the Lions Weir and takes you along to the historical Ranford Pool. The water hole is a deeper part of the river created when the Tannin Factory was operational in the early 1970’s, and is quite popular with the local children as a swimming hole. The walk trail is signposted along its length and also has informative signs on the different bird species and fish species you can experience. Tullis Bridge is located approximately 9 km’s out of Boddington. The bridge was built in 1912 in the trestle style and was used to link the railway line from Pinjarra to Narrogin for use by the timber industry up until 1968. Tullis Bridge now remains as two separate structures at either side of the riverbank as it was set alight in the early 1990’s by some campers in the area. A walk trail links the town site of Boddington to Tullis Bridge along the Rail Reserve and is approximately a 16km return trip along the river, through open paddocks and timber reserves. Once at Tullis Bridge you can enjoy a picnic at the picnic tables or sit under the canopy of trees that stretch alongside the Hotham River. A separate 3km walk trail has been created out at Tullis Bridge that takes you around the bridge and surrounding river. Toilets are available at this site. The drive out to Tullis Bridge along Morts Road offers some magnificent vistas, taking you past the back of the BHP Boddington Bauxite Mine, Marradong Reserve, olive groves and orchards. Located along the Pinjarra – Williams road on the west side approximately 1km from the turn off. The foundation stone of the Church was laid in 1894 by Arthur Batt and the church remains in excellent condition to this day. You are able to enter the church and view the historic jarrah flooring, timber and tin roof and old kerosene lamps (now wired) hanging from the roof trusses. The last service recorded was in September 2012. The cemetery sits immediately behind the church and takes in a beautiful view of the surrounding countryside. It is the only structure left from the original Marradong Town site. 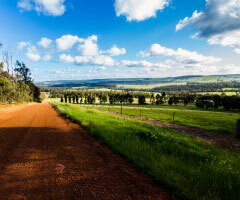 Located on the Bannister/Marradong Road approximately 5kms south of Boddington, clearly marked by a roadside sign. Dilyan lived with his tribe in the Wandering/Williams area, although he spent the last year of his life in Boddington. Dilyan accompanied Sir John Forrest in the North West and worked as a shepherd in the Marradong/Boddington area for HS Ranford, Jack Dowsett and Charles Farmer. He was a highly recognised tracker and known for his bravery. Dilyan was killed by local natives in 1886 as the result of a long-standing feud between 2 tribes. Located on the corner of Wuarming Avenue and Johnstone Street the Arts Centre sells a diverse range of handcrafted local arts and crafts and is the centre for many of our community arts groups. The shop is open Tuesday, Wednesday, Friday, Saturday and Sunday from 10.30am to 2.30pm. The Boddington Golf course is an 18 hole dry course with sand greens that are best played on during the winter and spring months. The course is available to visitors for a fee of $10 into the honesty tin provided on site. Ladies day is Wednesday and both men and women play on Saturdays. The Community Club is their clubhouse and offers evening meals on Friday nights to everyone and a fully stocked bar. It is a very family friendly environment with the meeting room often allocated for children to sit and watch DVD’s and let mum and dad enjoy a relaxing drink at the end of the day. The Boddington Community Markets group hold markets throughout the year. The markets offer a wide range of local and regional produce as well a good hearty breakfast. You can also find handmade clothing, jams and preserves and many other items of arts and craft. For up to date information on dates, times and venue call the Shire 08 9883 4999.